Physicist Richard Steiner adjusts the electronic kilogram, an experimental apparatus for defining mass in terms of the basic properties of nature. GAITHERSBURG, MD—A leading experimental method for defining the kilogram in terms of properties of nature is now more accurate than ever, scientists at the Commerce Department's National Institute of Standards and Technology (NIST) reported today. The advance may move the scientific community closer to redefining the kilogram, the only one of the seven basic units of the international measurement system still defined by a physical artifact. The latest NIST work, described in the October 2005 issue of Metrologia and published online today,* confirms the institute's 1998 results using the same method while reducing the measurement uncertainty by about 40 percent, thanks mainly to improvements in the hardware used in the experiments. "The fact that we got the same values gives us confidence that the uncertainties we're quoting are probably reasonable," says NIST physicist Richard Steiner, lead author of the paper. Scientists at NIST and other institutions around the world have spent years conducting experiments to find a reliable definition based in nature to replace the current international standard for the kilogram, a century-old cylinder of platinum-iridium alloy about the size of a plum. The new results mean that the NIST method, using an apparatus called the watt balance or electronic kilogram, is almost accurate enough now to meet the criteria for redefinition. In the NIST watt balance experiment, a kilogram test mass is placed on a balance pan that is connected to a coil of copper wire, which surrounds a superconducting electromagnet. If electric current is sent through the coil, then just as in an electric motor, electromagnetic forces are produced to balance the weight of the test mass. The apparatus measures this current and force. The apparatus also can move the coil vertically, and, like an electric generator, that induces a voltage. The velocity and voltage of the coil also are measured. These four measurements determine the relationship between mechanical and electrical power, which can be combined with other basic properties of nature to redefine the kilogram. Any decision about when and how to redefine the kilogram would be made by an international group, the International Committee for Weights and Measures, CIPM, and ratified by a General Conference on Weights and Measures (CGPM), which next meets in 2007. The CGPM likely will delay a redefinition until other groups confirm the new NIST results. The primary kilogram standard is currently maintained at the Bureau International des Poids et Mesures (BIPM) near Paris. Although the cylinder is housed in a special vault under controlled conditions, its mass can drift slightly over time and can change because of contamination, material loss from surface cleaning or other effects. Moreover, the standard is accessible only at BIPM and could be damaged or destroyed. By contrast, a property of nature is by definition always the same and can, in theory, be measured anywhere. The other six basic units of the international measurement system are the meter (unit of length), second (time), ampere (electric current), kelvin (temperature), mole (amount of substance) and candela (luminous intensity). All six are defined in terms of properties of nature and can be measured at any suitably equipped laboratory. The NIST watt balance is a two-story-high apparatus designed to define mass in terms of fundamental physics and quantum standards. 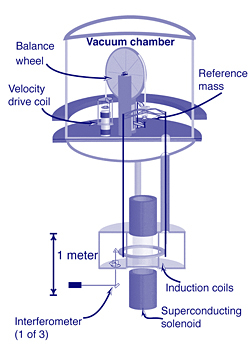 It measures the force required to balance a 1-kilogram mass artifact against the pull of Earth's gravity, as well as two electrical values (see graphic below). These measurements are used to determine the relationship between mechanical and electrical power, which can be combined with several equations to define the kilogram in terms of basic properties of nature. One of these properties is the Planck constant, the ratio of the energy of radiation to its frequency. This is one of an extensive set of "fundamental constants" used by scientists to predict a wide range of phenomena. The latest NIST value for the Planck constant reported in the new paper (6.62606901 x 10-34 joule seconds) is equivalent to the 1998 NIST result and a 1988 measurement by the National Physical Laboratory in the United Kingdom, which are the two other most accurate values. The watt balance is one of two leading approaches for redefining the kilogram. The other approach involves counting how many atoms of a specific atomic mass equal the mass of 1 kilogram. The latest NIST measurements, which have an uncertainty of 0.052 parts per million compared to 0.087 parts per million in the 1998 experiments, are far more precise than any previous results by any research group using either approach, according to Steiner. The total uncertainty is calculated by adding up more than 20 sources of error. The precision of the latest NIST measurements is roughly equivalent to the suspected drift in the current kilogram standard's mass over time, Steiner says. The NIST researchers hope to further reduce the uncertainty of the watt balance measurements to 0.02 parts per million within the next year or so, to reach the level of precision needed for commercial mass measurements in the near future. The measurements reported in Metrologia are the product of numerous improvements in NIST's watt balance, including reconstruction of most of the hardware to eliminate many sources of error. The coil and balance were enclosed in a fiberglass vacuum chamber, which reduced the need for air corrections. In addition, the coil was stiffened to reduce flexing that caused excess "noise" in the signals being measured. Noise was reduced to one-fifth of the level of the 1998 experiments. Researchers also improved the alignment of instruments, temperature control and the software used for management and analysis of the experiments. As an agency of the U.S. Department of Commerce's Technology Administration, NIST develops and promotes measurement, standards and technology to enhance productivity, facilitate trade and improve the quality of life. * R. Steiner, E.R. Williams, D.B. Newell and R. Liu. "Towards an electronic kilogram: an improved measurement of the Planck constant and electron mass." Metrologia. 42 (2005) 431-441. Published online Sept. 13, 2005. For additional background on efforts to re-define the kilogram in terms of natural properties see: "Replace Kilogram Artifact Now With Definition Based on Nature, Experts Say."